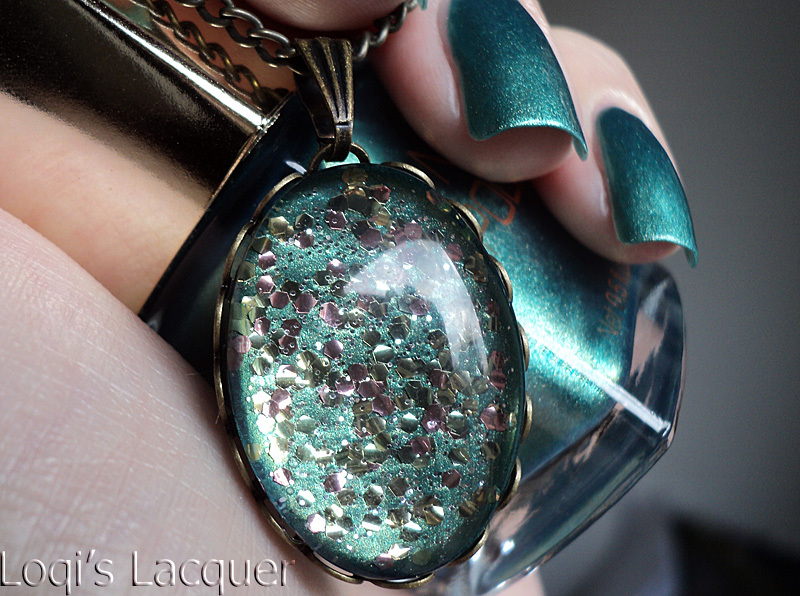 Today I have got something for you that I am very proud off: another piece of self made jewelry! The polish I am wearing here is from H&M, called Fantasy Ocean. 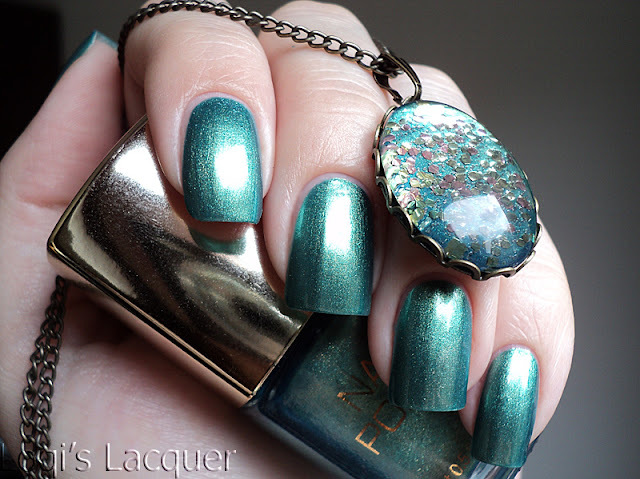 It's a pretty mermaid green with golden shimmer. The formula is just awesome! 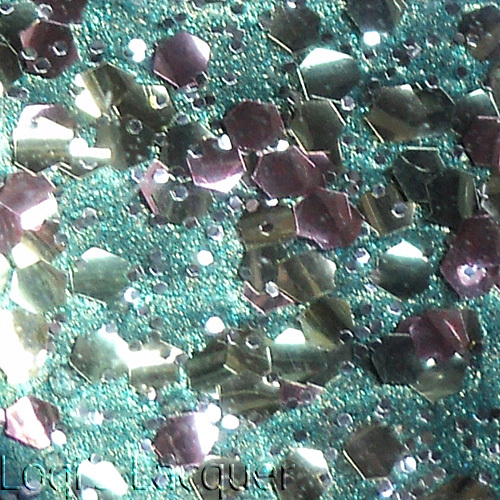 This is 2 smooth coats, and it dries very fast and VERY shiny. The pendant is made with 2 coats of Fantasy Ocean underneath 3 coats of a very unusual Claires glitter (sadly these don't have names around here). It consists of green, gold and pink hex glitter mixed with very small, round gold glitter. It's simply stunning in real life and it went great with the H&M. The pendant is around 25x18 mm and set in a bronze coloured setting with a pretty decorative border. I hope you guys like it and see you soon! This is gorgeous!! :) Where do you get your jewelry supplies? 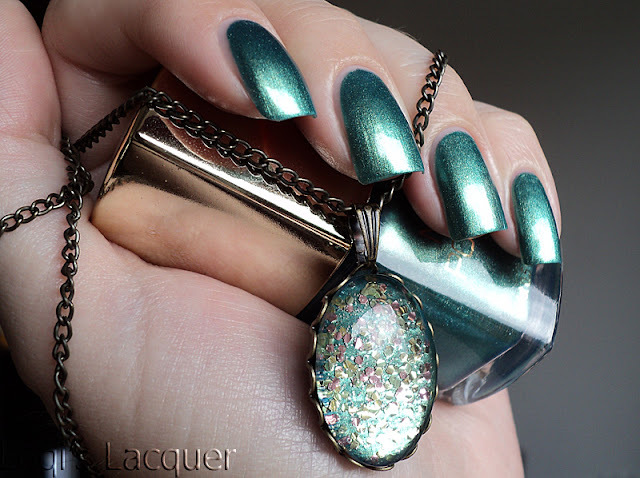 What a gorgeous green on your nails and I absolutely love that pendant!! Awesome jewelry! I love the colors. The pendant actually reminds me of colorful stones on the sea bottom, that you can see through the clear, beautiful sea water. It's really beautiful. Thank you! I get my supplies from Dutch webshops and bead shops nearby. But Etsy and Ebay have loads of stuff too! Thank you very much. I'm kind of self concious about my picture skills, so that means a lot to me! That H&M is amaaazing. And your pendant does look very pretty! All you need is a setting and a clear glass cabochon, check out Ebay or Etsy!